John and I have become huge fans of Mexican cooking since moving out to California 15 years ago. The Bay area has so many amazing and authentic restaurants to choose from that we rarely cook Mexican at home. Now that I am blogging about food, I realize that I need to get out of my comfort zone and try some new dishes. I recently asked a friend what type of dish she would like to see on my blog next, and she said anything Mexican. So I listened to her request and perused through my stack of cookbooks for some Mexican inspiration. 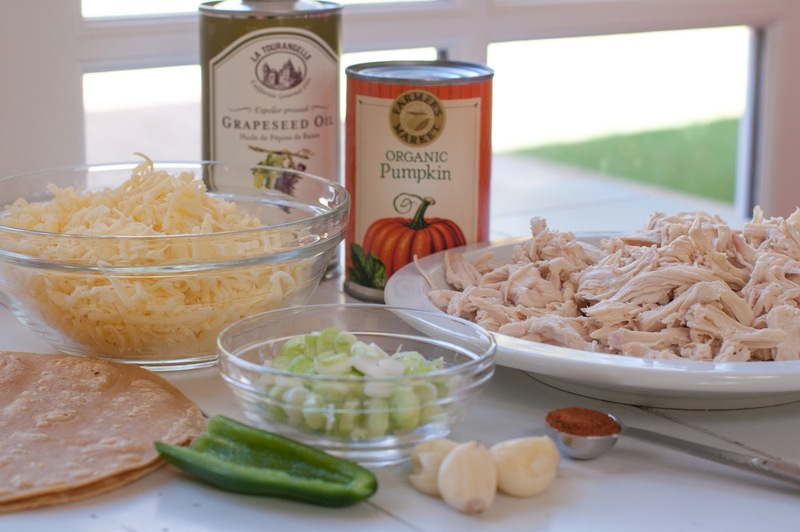 I stumbled upon this pumpkin enchilada recipe in my Everyday Food cookbook, and since it was fall, I decided to try it. I love anything with pumpkin and this sauce looked so savory and rich. I have always had pretty good success with recipes from Every Day Food, so I knew it would turn out decent (fingers crossed). This dish had since become one of our family’s favorite dinners. Every time I make it, I get a thumbs up from the family. The corn tortillas add so much flavor and texture to the dish. It’s the perfect blend of spices and flavor. We love serving these alongside a nice big salad, like my kid friendly caesar salad. This is also another great make ahead meal. This dish can be assembled up to 8 hours ahead of time; refrigerate, covered with tin foil or plastic wrap, until ready to bake (add a few minutes to the cooking time). You can also make the sauce ahead of time and cover and refrigerate it. Cook and shred the chicken and add the scallions and salt to it and refrigerate and cover till you’re ready to assemble the enchiladas. When its time to then make the enchiladas, all you have to do is warm up the tortillas and assemble the enchiladas. UPDATE: I wanted to let you all know that I was at the grocery store today and noticed that the organic pumpkin (shown below ) now comes in BPA free cans! Yippee! Preheat oven to 350 degrees. 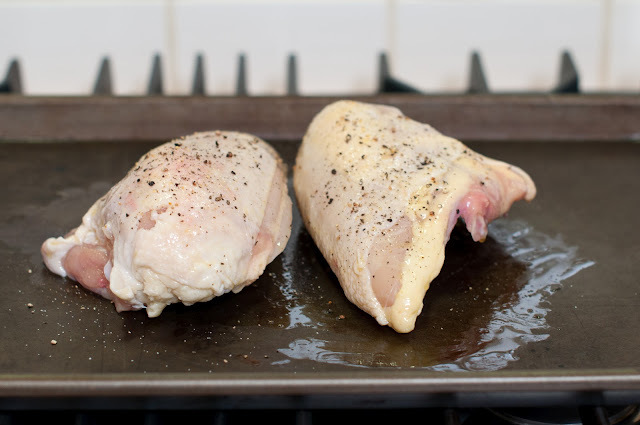 Place the chicken breasts skin side up on a rimmed baking sheet. Rub them with olive oil and sprinkle with salt and pepper. Roast the breasts for 35 to 40 minutes or until chicken is cooked through. I always use my meat thermometer here and take the chicken out when it reaches an internal temperature of 165º. Want to know a super cool trick for shredding chicken? I learned this step from my good friend Carolyn. While the chicken breasts are still pretty warm, (you really want them warm to hot for this next step to work) remove the skin from chicken and then using a knife, slice the chicken breast off of the bone. Get out your kitchen aid mixer, throw the chicken breasts into the bowl and put your paddle attachment on. Turn the mixer on to speed 4 and in approximately 20 seconds you will have shredded chicken. Super cool right? I didn’t believe it either till I saw it with my own eyes. See, now you can believe it as well because there’s proof in the below photo. Note: The original recipe called for 1/2 of a rotisserie chicken so you can also use that if you wish. We’re not fans of dark meat in this house, so I always just roast up some breasts when a recipes calls for shredded or cubed chicken. I learned this trick from the Barefoot. Note: For time efficiency, the chicken can be roasted and shredded up ahead of time and stored in the refrigerator until needed. Once your chicken has been shredded, it’s time to start assembling the enchiladas. Preheat your oven to 425 degrees for the enchiladas. As you know, I like to prep all my ingredients ahead of time, so lets get prepping! Slice up your scallions, peel your garlic, chop up your jalapeño chile and grate your fresh cheddar cheese (you can just buy the cheese grated as well). In a blender, add 2 1/2 cups water, the pumpkin puree, garlic, jalapeno, chili powder, 2 teaspoons salt, and 1/4 teaspoon pepper and puree until smooth (hold top firmly as blender will be quite full). 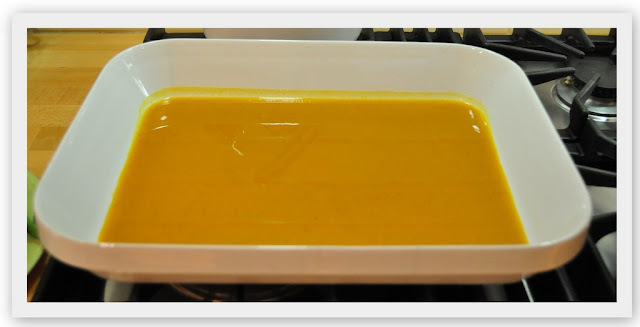 Pour 1 cup of the sauce in the bottom of a rectangular baking dish. 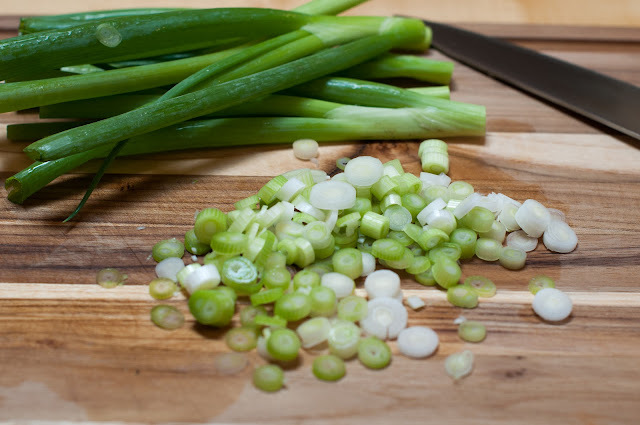 In a medium bowl, combine the shredded chicken and scallions and season generously with salt and pepper. Now its time to heat up your corn tortillas so they do not break apart while rolling them. I learned this amazing trick from simply recipes and it works every time. In a medium sized skillet at medium-high heat add 2-3 tablespoons of grape seed oil. Add a tortilla to the pan. Cook for 2-3 seconds, lift up the tortilla with a spatula, add another tortilla underneath. Cook for 2-3 seconds, lift again, both tortillas, and add another tortilla underneath. Repeat the process with all the tortillas, adding a little more oil if needed. This way you can brown and soften the tortillas without using a lot of fat. You do this process to develop the flavor of the tortillas. 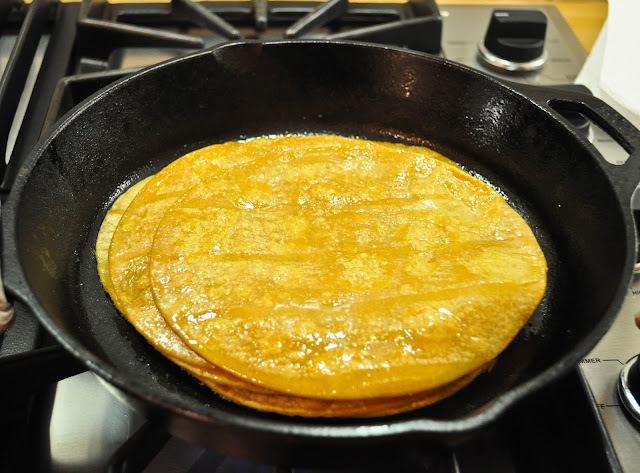 As the tortillas brown a little, remove from the pan one by one to rest on a paper towel, which absorbs any excess fat. 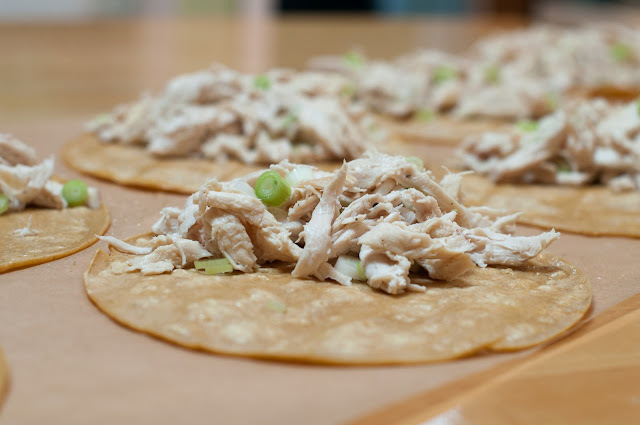 Lay the tortillas on work surface; mound chicken mixture on half of each tortilla, dividing evenly. Its best to put the chicken to one side of your tortilla and roll it up from there. Roll it up as you would a sleeping bag. Roll up each tortilla into a tight log; place seam side down over the sauce in the baking dish. I didn’t use all of my sauce here as I thought there was too much. I poured what I thought was enough sauce and then threw away the rest, so just use your judgement here. 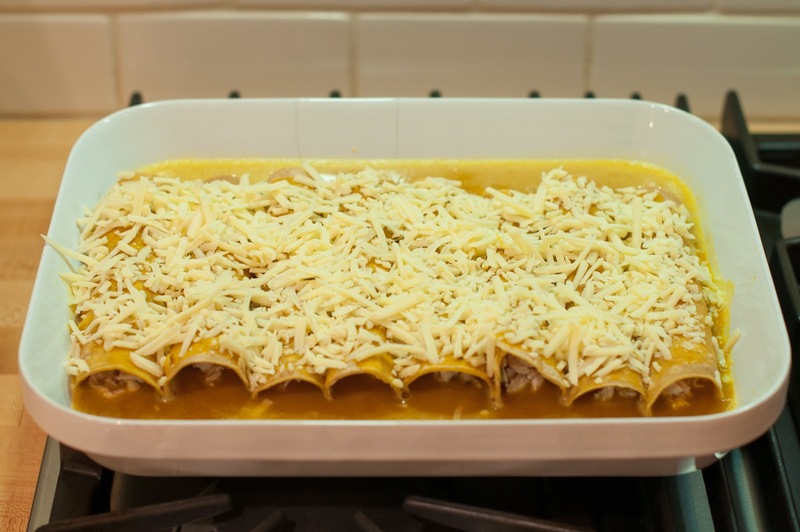 Finish by topping the enchiladas with the sharp cheddar cheese. Bake the enchiladas uncovered in a 425 degree oven until the cheese is golden and the sauce is bubbling, 25 to 30 minutes. Let cool 5 minutes before serving. Top your enchilada with a dollop of sour cream and serve with a vegetable of choice or a nice green salad. I must admit it wasn’t the prettiest dish I’ve ever made, but it sure got rave reviews on the taste, and we ate it happily two nights in a row.Kids and hubby also requested that I make it again, very soon. Preheat oven to 350 degrees. 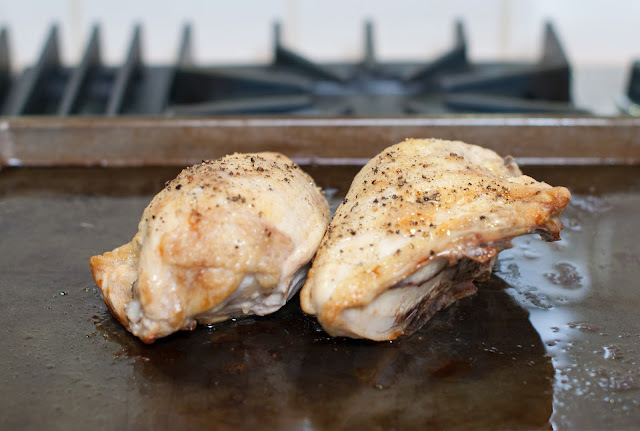 Place the chicken breasts skin side up on a rimmed baking sheet. Rub them with olive oil and sprinkle with salt and pepper. Roast the breasts for 35 to 40 minutes or until chicken is cooked through. I always use my meat thermometer here and take the chicken out when it reaches an internal temperature of 165º. Want to know a super cool trick for shredding chicken? While the chicken breasts are still pretty warm, (you really want them warm to hot for this next step to work) remove the skin from chicken and then using a knife, slice the chicken breast off of the bone. Turn the mixer on to speed 4 and in approximately 20 seconds you will have shredded chicken. Note: The original recipe called for ½ of a rotisserie chicken so you can also use that if you wish. We're not fans of dark meat in this house, so I always just roast up some breasts when a recipes calls for shredded or cubed chicken. I learned this trick from the Barefoot. 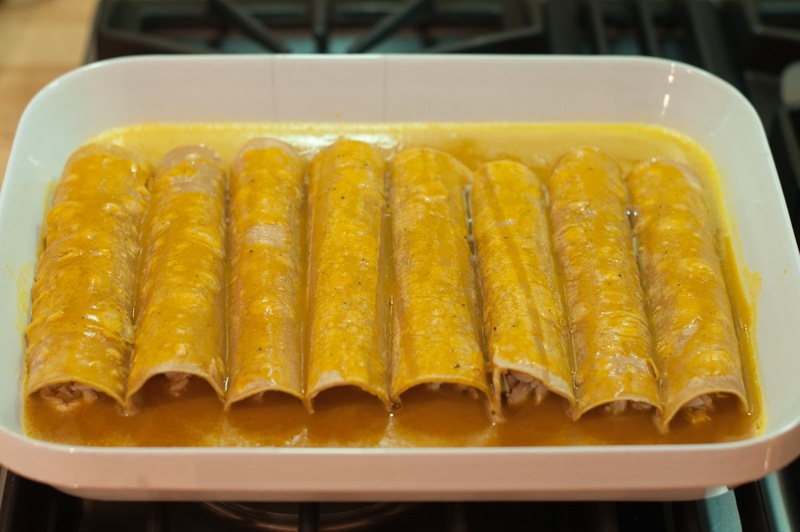 Once your chicken has been shredded, it's time to start assembling the enchiladas. Preheat your oven to 425 degrees for the enchiladas. As you know, I like to prep all my ingredients ahead of time, so lets get prepping! Slice up your scallions, peel your garlic, chop up your jalapeño chile and grate your fresh cheddar cheese (you can just buy the cheese grated as well). 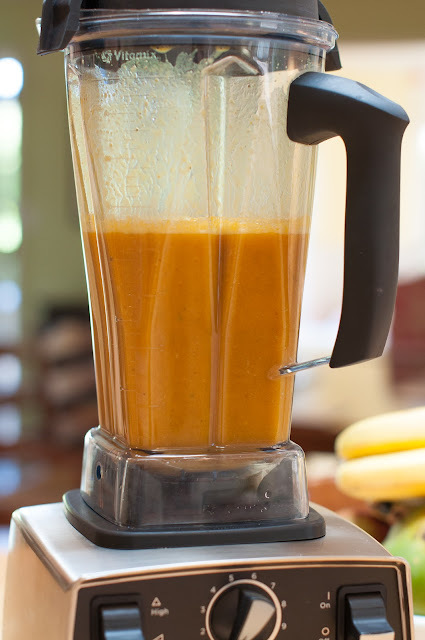 In a blender, add 2½ cups water, the pumpkin puree, garlic, jalapeno, chili powder, 2 teaspoons salt, and ¼ teaspoon pepper and puree until smooth (hold top firmly as blender will be quite full). Pour 1 cup of the sauce in the bottom of a rectangular baking dish. 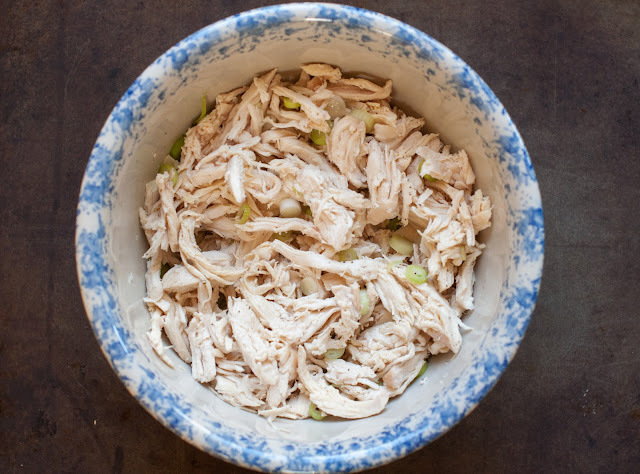 In a medium bowl, combine the shredded chicken and scallions and season generously with salt and pepper. 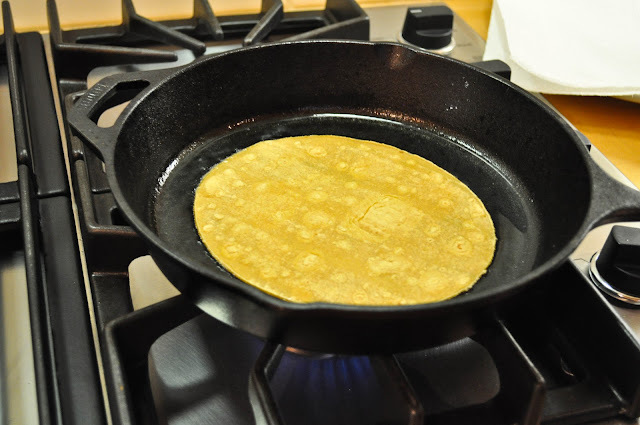 Now its time to heat up your corn tortillas so they do not break apart while rolling them. Add a tortilla to the pan. Cook for 2-3 seconds, lift up the tortilla with a spatula, add another tortilla underneath. Cook for 2-3 seconds, lift again, both tortillas, and add another tortilla underneath. Roll it up as you would a sleeping bag. Roll up each tortilla into a tight log; place seam side down over the sauce in the baking dish. I didn't use all of my sauce here as I thought there was too much.I poured what I thought was enough sauce and then threw away the rest, so just use your judgement here. Finish by topping the enchiladas with the sharp cheddar cheese. Bake the enchiladas uncovered in a 425 degree oven until the cheese is golden and the sauce is bubbling, 25 to 30 minutes. Let cool 5 minutes before serving. Top your enchilada with a dollop of sour cream and serve with a vegetable of choice or a nice green salad. Hi, love your blog. Love how you love your family! I combined all the extras,with the cauliflower,and made a soup just for me! Just came across your blog from foodgawker. 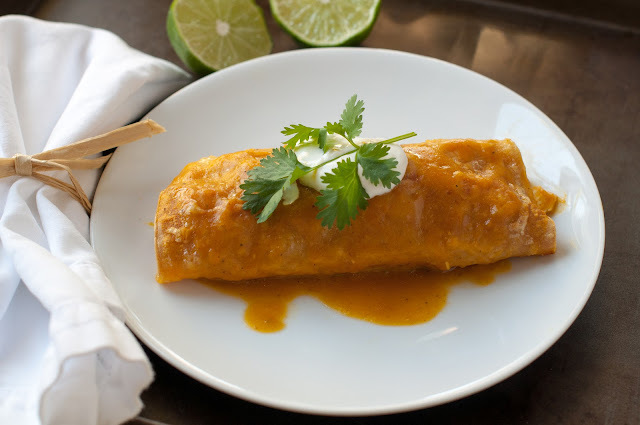 I love pumpkin sauce enchiladas. I’ll have to try this one out sometime. That is one of the prettiest casserole dishes I’ve ever seen! So large and modern — love it. This is a great idea for this traditional Mexican dish replacing the traditional tomatoes sauce with these smooth and silky pumpkin puree. Oh my husband would go crazy for these! He loves pumpkin sauce on these burritos he gets at his favorite restaurant. Hi Wendy! Your family likes Mexican so I am sure they will like this. Don’t tell the kids it’s made with the pumpkin puree as that might throw them off. Eli and Zoe loved this and I was surprised as I was not sure how they were going to feel about pumpkin.